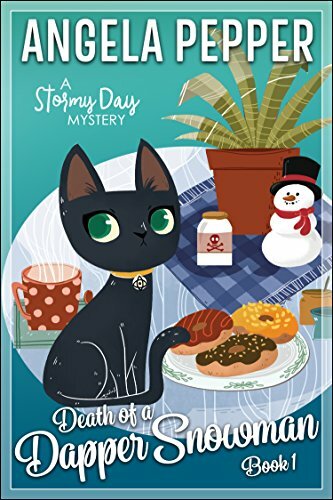 After finding a corpse hidden in a snowman, Stormy is determined to find the culprit — with the help of a mischievous feline named Jeffrey. With nonstop twists and turns, this clever tale is a must-read! When the daughter of a cop finds a body next door, she's the only one who can solve the strange mystery. Stormy Day has moved back home, and it's not for the local coffee or nightlife, both of which are lacking in Misty Falls, Oregon. She's there to help her father finally retire from being a cop, and slow the heck down after his hip replacement. Plus she needs to give her brain a break from the high-stakes world of venture capital. But when she makes a shocking discovery next door, Stormy's clever brain kicks into overdrive. This murder is too difficult for the local boys in blue to figure out. The new captain of the police department tells her to mind her own business, but he doesn't take his own advice. He's always breathing down her neck like a jealous ex-boyfriend (which he is). What's there to be jealous of? Stormy's not even dating anyone. She's certainly not going to date the ruggedly handsome, bearded lawyer who's renting half her house. No way. Every time she sees Mr. Logan Sanderson, the town's newest resident, he's insulting her one way or another. The man should show his landlady a little more respect! He's the worst. Sort of. It would be easier to hate him if he weren't so cute underneath that bushy beard. Now there's a murder to solve, and since the legendary Finnegan Day is recovering from surgery, it's up to his determined daughter Stormy to save the town from a twisted killer. If she fails to solve this twisted puzzle in time, someone close to her will pay a terrible cost. “Stormy ranks right at the top with the mysteries I've read, laughed at and loved.” - Barb S.
“If you like good mysteries with lots of twists and fun along the way, this is the perfect series for you.” - Sewanee K.
“Engaging characters to love.” - Vi Marie S.
“Refreshing and new... I love the cat and all other characters.” - A. K.
“Kept me up late, reading just one more chapter, and guessing right up until the end!” - Jayne M.